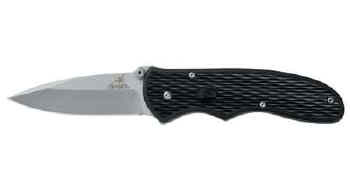 Gerber Legendary Blades is proud beyond description to introduce our first spring-assisted knife. The FAST Draw relies on our proprietary new blade opening concept—Forward Action Spring Technology— that's so lightning-quick, so pleasingly easy to open with just one hand, its already drawing a lot of attention among knife folks everywhere. The mechanism was created exclusively for us and patented by famed Oregon knife maker Butch Vallotton. Should you choose, you can open the FAST Draw in the traditional way, using the thumb stud. Or, if speed is the order of the day, you can simply trigger the blades sudden release with your index finger. Its an exciting knife concept that certainly belongs in your collection.